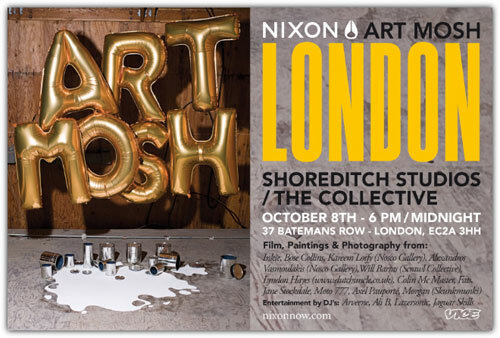 The philosophy of Art Mosh is to showcase contemporary artists in one-off ‘Pop-Up’ events in major cities. Paris Art Mosh not only bought together artists from South Africa, France, Germany, USA, Italy, UK, Belgium and Greece, it also transcended the traditional barriers between different media, by exhibiting photography, painting, design, illustration and prints in an eclectic exhibition. Nixon supports emerging and established talent in the fields of art and music, and unites artists and production team with the common goal of creating buzzy, energetic ‘Pop Up’ exhibitions. Supported by internationally renowned brand Nixon, in partnership with Wallpaper and Nissan, and curated by Paddy Barstow of Six 18, Art Mosh Paris attracted a cool crowd of Parisien collectors, artists, and movers & shakers from the media, art, fashion and music worlds.